I've always thought there's something magical about ponds. At first arrival you may be mistaken in thinking they seem pretty lifeless. Yet if you quietly settle for a while you can find yourself becoming increasingly drawn in to the mysterious, shadowy depths, and those little hints of life it harbours. Those secret denizons may be shy at first remaining hidden from obvious sight, with maybe only a touch of movement in the reeds or a swirl of sediment hinting at unseen stirrings below. Yet if you stay still you'll soon realise just how alive it is, and you can find yourself captivated as you become more and more tuned in to the life it holds. A pond rich in wildness can lull us into sleepy revorie as shadows and changes in light dance across it's surface, as time ceases to exist and yet there's almost an edge-of-seat anticipation of what might happen next. Ponds can unlock the child in us. From season to season even the smallest wildlife pond is such an attractent to wildlife from frogs, toads and newts, to the gorgeous array of dragonflies and damselflies and a whole host of other fascinating creatures, not to mention some of our most beautiful wild flowers. It's amazing how quickly a new pond can become colonised too. 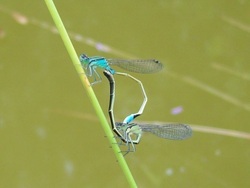 Our pond had dragonflies of various sorts breeding in it during the very first summer. Then of course you have the animals and birds whom visit it upon passing through, such as bats gourging on the midges in summer. Without a doubt the garden pond has been a life saver for so many of our native creatures once thought of as "common," and can bring you endless hours of delight and excitement.